The Tope Called “Weapons Laid Down.” The Council of Vaisali. East from this city ten yojanas, (the travellers) came to the kingdom of Vaisali. North of the city so named is a large forest, having in it the double-galleried vihara where Buddha dwelt, and the tope over half the body of Ananda. Inside the city the woman Ambapali built a vihara in honour of Buddha, which is now standing as it was at first. Three le south of the city, on the west of the road, (is the) garden (which) the same Ambapali presented to Buddha, in which he might reside. When Buddha was about to attain to his parinirvana, as he was quitting the city by the west gate, he turned round, and, beholding the city on his right, said to them, “Here I have taken my last walk.” Men subsequently built a tope at this spot. Three le north-west of the city there is a tope called, “Bows and weapons laid down.” The reason why it got that name was this:— The inferior wife of a king, whose country lay along the river Ganges, brought forth from her womb a ball of flesh. The superior wife, jealous of the other, said, “You have brought forth a thing of evil omen,” and immediately it was put into a box of wood and thrown into the river. Farther down the stream another king was walking and looking about, when he saw the wooden box (floating) in the water. (He had it brought to him), opened it, and found a thousand little boys, upright and complete, and each one different from the others. He took them and had them brought up. They grew tall and large, and very daring, and strong, crushing all opposition in every expedition which they undertook. By and by they attacked the kingdom of their real father, who became in consequence greatly distressed and sad. His inferior wife asked what it was that made him so, and he replied, “That king has a thousand sons, daring and strong beyond compare, and he wishes with them to attack my kingdom; this is what makes me sad.” The wife said, “You need not be sad and sorrowful. Only make a high gallery on the wall of the city on the east; and when the thieves come, I shall be able to make them retire.” The king did as she said; and when the enemies came, she said to them from the tower, “You are my sons; why are you acting so unnaturally and rebelliously?” They replied, “If you do not believe me,” she said, “look, all of you, towards me, and open your mouths.” She then pressed her breasts with her two hands, and each sent forth 500 jets of milk, which fell into the mouths of the thousand sons. The thieves (thus) knew that she was their mother, and laid down their bows and weapons. The two kings, the fathers, thereupon fell into reflection, and both got to be Pratyeka Buddhas. The tope of the two Pratyeka Buddhas is still existing. 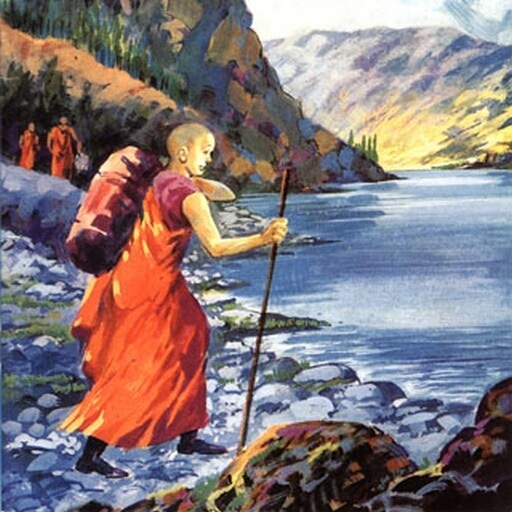 In a subsequent age, when the World-honoured one had attained to perfect Wisdom (and become Buddha), he said to is disciples, “This is the place where I in a former age laid down my bow and weapons.” It was thus that subsequently men got to know (the fact), and raised the tope on this spot, which in this way received its name. The thousand little boys were the thousand Buddhas of this Bhadra-kalpa. It was by the side of the “Weapons-laid-down” tope that Buddha, having given up the idea of living longer, said to Ananda, “In three months from this I will attain to pavi-nirvana;” and king Mara had so fascinated and stupefied Ananda, that he was not able to ask Buddha to remain longer in this world. Three or four le east from this place there is a tope (commemorating the following occurrence): A hundred years after the pari-nirvana of Buddha, some Bhikshus of Vaisali went wrong in the matter of the disciplinary rules in ten particulars, and appealed for their justification to what they said were the words of Buddha. Hereupon the Arhats and Bhikshus observant of the rules, to the number in all of 700 monks, examined afresh and collated the collection of disciplinary books. Subsequently men built at this place the tope (in question), which is still existing.